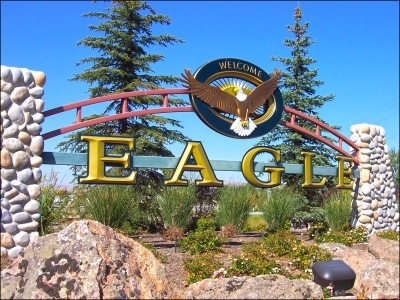 You are going to love Eagle Idaho! For the sports and outdoor enthusiast, Eagle provides plenty of options. Fly fish the Boise River, bike the Green Belt, or take the family to Eagle Island State Park for a day of swimming. Local golf courses include Eagle Hills Golf Course and Banbury Golf Course, which has been consistently ranked in the top ten golf courses in Idaho by Golf Digest. The Eagle Sports Complex, an 85 acre park, features a skateboard park, BMX tracks, and basketball hoops. Eagle boasts high-end boutique shops and award-winning restaurants. Shop the Saturday market for unique arts, crafts, produce, and specialty food items. Community events are planned all year long, including Eagle Fun Days, the Gazebo Concert Series downtown, the Eagle Food and Wine Festival, and the Eagle Country Christmas. Eagle public schools are in the West Ada School District and emphasize academic success, safe and supportive schools, as well as family, staff, and community engagement. Eagle Middle School, Eagle Hills Elementary, and Eagle High School have all earned a 9/10 rating from GreatSchools.org. Classic architecture and historic accents meet modern amenities to create a luxurious, warm atmosphere. Meandering walking paths and pocket parks provide great opportunities to meet neighbors and enjoy everything Eagle has to offer. Take a look at the featured houses in Eagle and let us help you explore this premiere zipcode.